Students are generally told to “make the most” of their time at university. University of New Brunswick Saint John student, and one of its 2017 Graduating Student Leadership Award winners, Dana Dodsworth seems to have taken that advice to heart. Ms. Dodsworth checked those boxes and then some, completing multiple co-op placements and garnering several scholarships, including the Governor Thomas Carleton Scholarship, the Colter Family Bursary, the Richard Burpee Scholarship, an Alumni Undergraduate Scholarship and the Dr. Colin B. Mackay Scholarship. She has also been named UNB Saint John Co-op Student of the Year for 2017, sits on multiple boards and councils, and played two seasons on the school’s varsity volleyball team. She will be capping it all with a job offer from a major Canadian company just as she prepares to graduate. The Quispamsis native was scouted by UNB Saint John Volleyball and decided, after visiting the school, that UNB was the place for her. 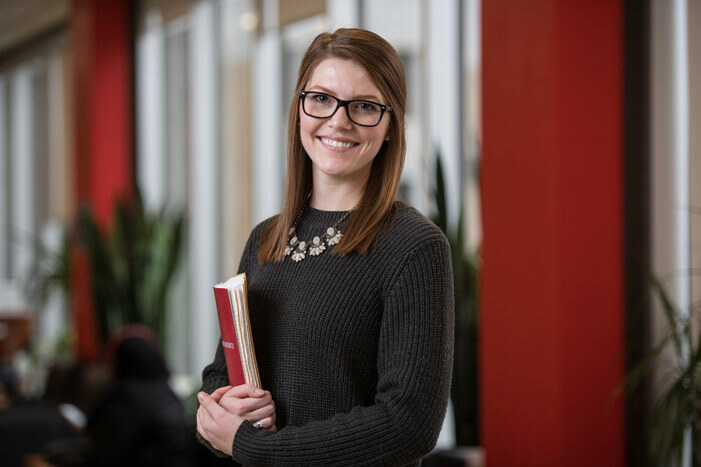 Since beginning her Bachelor of Business Administration in 2014, Ms. Dodsworth has completed three work terms (TD Insurance, and Irving Oil twice). Supplementing her class schedule with volunteer activities on top of varsity athletics might seem like overloading, but Ms. Dodsworth says that it’s actually the key to keeping her organized. As a recipient of the Cedric Ritchie Scotiabank International Study Award, Ms. Dodsworth was able to spend the winter term of 2016 studying at the Burgundy School of Business in Dijon, France. With these experiences under her belt, she felt confident to apply for a Future Funds Scholarship this year. The award included the opportunity to represent UNB at Canada’s Outstanding CEO of the Year Award Gala in Toronto in late February. During a leadership session that select students attended with three of Canada’s top corporate executives, Calin Rovinescu, the president and CEO of Air Canada, told the students that there were jobs for them at the airline if they wanted them. Ms. Dodsworth took him up on the offer.